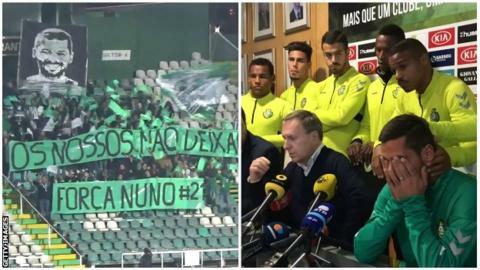 Portuguese defender Nuno Pinto has put his career on hold after being diagnosed with cancer. The news was revealed at a news conference where Pinto, 32, was joined by his Vitoria Setubal team-mates, coaching staff and club president. Pinto, who has lymphoma, broke down in tears, so club captain Vasco Fernandes addressed the media on his behalf. "He is a warrior. We will always be with him. He's one of ours and we never dropped one of our own," he said. "He is a great person and a great father. In a while we'll remember this as one more battle that we won." According to the Portuguese Primeira Liga club's doctor, the type and extent of Pinto's lymphoma is still to be determined by test results. Fans of Vitoria Setubal paid tribute to Pinto in the 21st minute of their Portuguese Cup (Taca de Portugal) defeat by Braga on Tuesday. A large banner of his face was unveiled along with the words: "Ours never dropped. Forca Nuno #21." Pinto has since thanked people for their support on his Facebook page. He wrote: "A thank you from the bottom of the heart and remember that health is the only thing we don't control. "This is an example for everyone... together to the end and this game is the most important of my life but the result will be only one - victory." Clubs and players around Portugal have shared messages of support for the left-back, who is married with three young children.